John Morton: Industrial power generation is important, and demand is growing. And at the heart of any power station’s pre-boiler system is the boiler feed pump. Most of these pumps are between-bearings, multistage centrifugal designs with mechanical seals installed at each end of the pump. Boiler feedwater pumps are used to increase the discharge pressure of the feedwater to the boiler. Boiler feed pumps serve to feed a steam generator such as a boiler or a nuclear reactor with a quantity of feedwater that corresponds to the quantity of steam emitted. To deliver the feedwater into the boiler steam drum, the boiler feed pump has to raise the pressure beyond the boiler steam drum pressure. P&S: Why are these pumps important? JM: Boiler feed pumps are critical assets to steam plants, and keeping them up and running is paramount to plant operations. These pumps must be reliable—rugged—to withstand continuous high pressure pumping operation and be suitable to cope with additional variable conditions. For example, the changing of water quality during operations has the potential to impact pump performance, especially if using a cooler on the pump. P&S: What sealing methods do plants typically use to keep boiler feedwater pumps running? 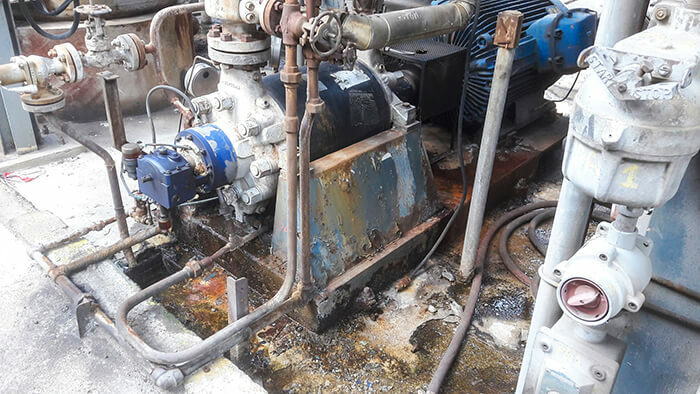 JM: The typical solution to keep boiler feedwater pumps running is using an American Petroleum Institute (API) piping Plan 23 and cooling the water in the vicinity of the seal to provide a lubricating medium. API Plan 23—the traditional method—relies on a cooling circuit to keep an area of the pump and the water in that area cool to prevent vaporization at the seal faces. This is done by circulating a quasi-closed loop of process water from the seal to a heat exchanger, then back to the seal. API Plan 23 is the most energy efficient and reliable method of sealing boiler feedwater. P&S: What are the common issues with these methods? JM: As with every method when it comes to maintaining proper sealing temperature, there can be an array of issues that present themselves and must be taken into account. Safety: The pressure of boiler feedwater is very high. When cracking any vent valves, a jet of water and vapor can be released causing a safety hazard if not addressed with proper engineering controls and operator training. Boiler feedwater can also be at dangerously high temperatures, and releasing a stream of hot water or steam into the plant itself can seriously injure those personnel in proximity. Steam burns present unique risks to plant workers since steam can be invisible, and steam burns release much more heat into skin due to the release of latent heat. Reliability: Operating a conventional mechanical seal on air for even a few seconds can shorten the life of the seal or cause complete seal failure. Too much venting has the ability to draw hot process water past the throat bushing and into the Plan 23 loop, causing an increase of temperature of the water at the seal and O-rings. Environment: It is a poor practice to discharge any process fluids to the environment even if the fluid is water. Stray moisture can enter bearing housings or electric motors. Water can also cause instrument or structural components to rust. P&S: Are there other options? JM:An API piping Plan 11 may also be employed. This solution eliminates the need for separate cooling and relies solely on a recirculation line from a higher pressure zone in the pump back to the stuffing box. This line provides flow to remove heat generated by the seal and also ensures the ambient temperature levels are maintained. This is usually only used in low duty boiler feedwater applications and would typically be in concert with a higher leakage seal. P&S: What situations make the change to a newer sealing technology worth the cost? JM: For a plant that is upgrading from packing or older seal technology, the cost of an API piping Plan 23 system may seem excessive. However, this solution has proven countless times to be the lowest life cycle cost while also capitalizing on reliability, safety and environmental factors. John Morton, chairman of the European Sealing Association, is product marketing manager at John Crane. He may be reached at john.morton@johncrane.com. For more information, visit www.johncrane.com.